"PARAISO" will premiere as the opening film of Singkuwento International Film Festival, Manila, Philippines on February 21, 2015 at NCCA Theater, Intramuros, Manila. In line with the celebration of the National Arts Month, National Commission for Culture and the Arts presents Singkuwento International Film Festival, Manila Philippines to be held at the Tanghalang Leandro Locsin located at the NCCA Bldg. in Intramuros, Manila from February 21 to 28. 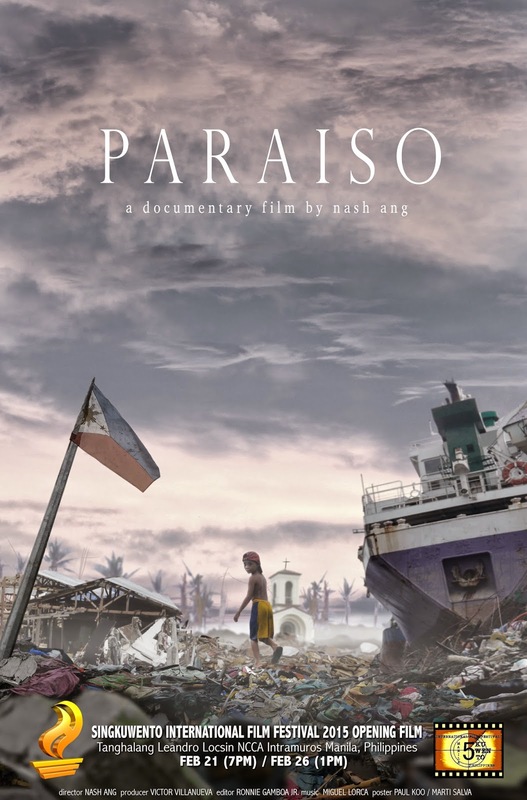 "Paraiso" is a documentary that follows the lives of child survivors and their remaining families one month after the tragedy of Super Typhoon Haiyan in the Philippines. Having a close brush with death, the storm surge ravaged their houses and took their loved ones away. We will see their struggles as they live on and rebuild their lives in what was once their Paraiso, which is but a memory of tragedy and great loss. This documentary film is a two-part story. The first part will be shown in Singkwento International Film Festival 2015. The 2nd half or the finale will show the developments of the story some year after the disaster.